All of us have met people on our journey who have made a profound impact on our lives. 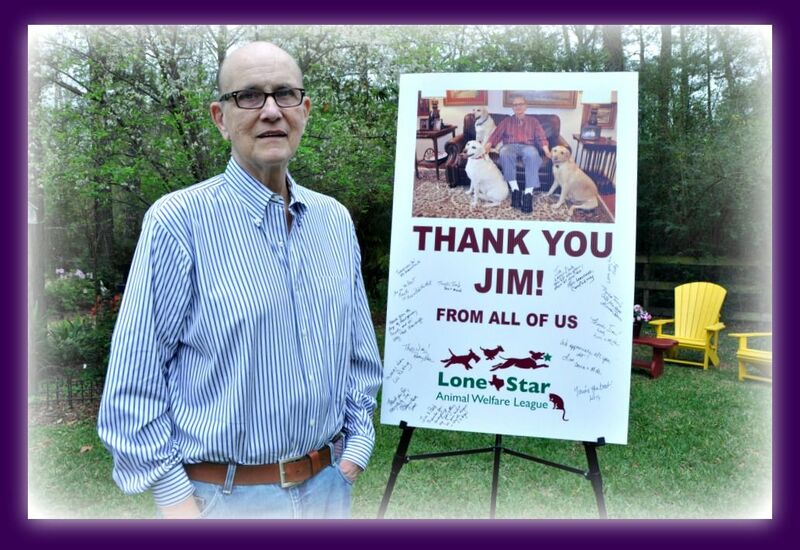 Jim McCullough did that for me and many of us volunteering for Lone Star Animal Welfare League. I met Jim after a SPRING BARK event when he called and said he would like to meet me and find out about our organizations missions. I met with Jim and Bob at a Starbucks. Our former Treasurer Tamie Boyd came with me. We explained what our accomplishments had been to that point and what our dreams were . We came away impressed with how animal focused they both were and how kind they were. Not long after that, The McCullough Foundation made a very generous donation to help us with not only our Fixing Montgomery County Program but also our Lab Rescue Program. There is NO DOUBT in my mind that Jim gave us the " wind beneath our wings" to accomplish so much for the animals here in Montgomery County. Because of Jim and his support, thousands of unwanted litters were prevented . They would have died in shelters or been dumped on roadsides. When we discussed such matters as a group, Jim would express his sorrow by shaking his head and asking how could that happen? " What else can we do?" When we heard good news or were able to make a difference in small ways, his eyes lit up and I will always remember his hearty laugh and smile. During our vaccination clinics, Jim was there drawing syringes and working the program..always giving ..always asking to do more. Bob too! Two awesome friends working for a cause that they loved. They fostered numerous labs for us and gave them great love and training along with their sweet lab girls, Jackie and Jill. Later a heartless owner surrender came in and they fostered dear 10 year old Rommey , giving him a wonderful home to live out his life. Jim McCullough..it has been a blessing to know you. Thank you for all you have done for our organization through your leadership and your big heart. We will miss you greatly.. Contributions received "In Memory of Jim McCullough"